Please note the Sky Garden will undergo refurbishment works from Friday 7th July 2017 and will last for a number of weeks to improve the visitor experience. Please expect longer queues. The Sky Garden has been designed to create an open and vibrant place of leisure, offering visitors a rare chance to experience London from a different viewpoint. “Donald Trump has made a successful bid for London’s iconic ‘Walkie Talkie’ building. 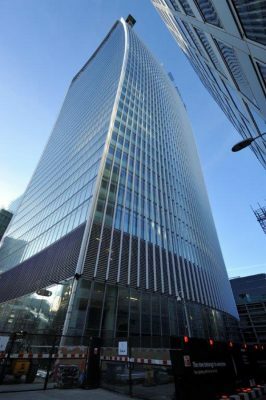 The President is reported to have paid around £600m for a 51 per cent stake in 20 Fenchurch Street and has already announced the move in characteristic style. 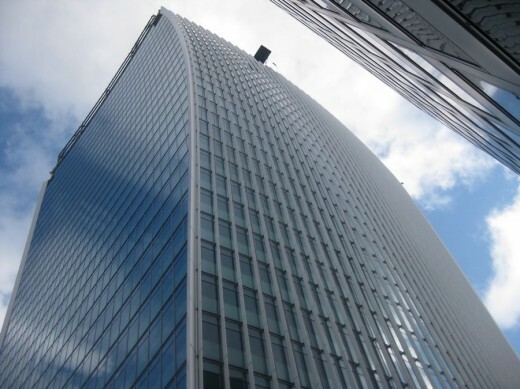 The heat-ray effect of the City’s Walkie-Talkie skyscraper which melted parts of cars in the City last summer will soon be fixed, the developers of the building said today, reports the London Evening Standard. The curved surface of the £500m building, being developed by Land Securities and Canary Wharf Group, created a ‘solar glare’ effect which focused sunlight and warped the panels of a Jaguar, melting the wing mirrors and badge. The nickname Walkie Scorchie is proving popular! 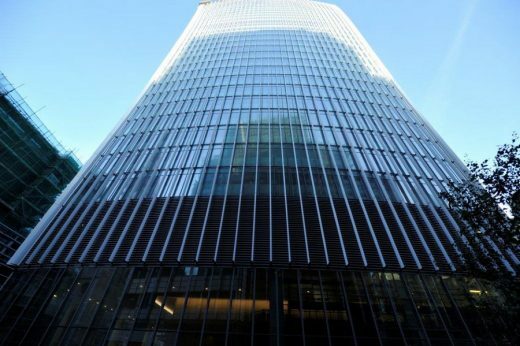 To fix the problem ‘sun shades’ will be fitted to the building under a “brise soleil” system, costing in the “low single digit millions” according to the firm. Planning permission has been granted for the solution and work will begin by the end of May, lasting around six months. The solution has been designed by the original architect Rafael Vinoly along with solar glare experts Loisos + Ubbelohde. A superb set of images of a building that is really difficult to capture. No doubt once the roof garden is completed a lot of attention will focus on it – well it is futuristic and unique for the capital – but the key views for most Londoners will be the ones Nick has used. The lines are smooth and beguiling but unlike most of the skyscrapers in the City the plan is square, which makes the basis for the tower a little dull. Hence the device of expanding the form outwards as it rises, creating interest. New photos of 20 Fenchurch St Building as construction of this controversial skyscraper nears the top. The 37-storey tower that breaks with the perceived boundaries of common architectural expression and is located away from the main cluster of skyscapers in the City of London. The building billows out towards the top, the opposite of a typical skyscraper design which aims to get more slender as it rises. Once the roof garden is in place – the Sky Garden at 20 Fenchurch Street – it will no doubt improve this building’s appearance, adding interest and lightness to partially offset the building’s huge mass, but only partially – this building is too bulky and goes against all that one learns as an architect and what one feels instinctively as a designer. Adrian Welch, editor. 1 May 2013. Progress photo of the 37-storey tower at 20 Fenchurch Street by Rafael Viñoly Architects. This major new London skyscraper is due to be completed in early 2014. Progress photos of 20 Fenchurch Street.